Vietnam is a the destination of choice for many tourist, with captivating scenery, exquisite cuisine and a fascinating history. 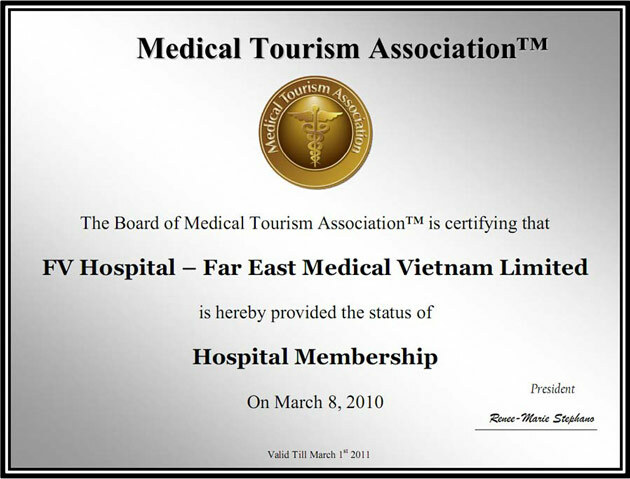 Now, world-class healthcare at FV Hospital can be added to Vietnam’s list of attractions. FV Hospital (wholly owned by French interests) in Ho Chi Minh City is the first international standard hospital in Vietnam and the first outside France to be HAS accredited (Haute Autorité de Santé – the leading French health care quality accreditation). As a top health care provider, we employ state-of-the-art medical equipment and doctors internationally-trained in more than thirty specialities. When you choose FV Hospital, we guarantee that you are in safe hands. Our staff are committed to compassionate, patient-centred care and to your return to full health. From the moment that you contact us, the care that you receive will be entirely integrated and co-ordinated by our own experienced medical and nursing teams and dedicated administrative and support staff. They approach each case on an individual basis, your full recovery being their first concern, engaging you in a dialogue to better understand your every requirement. Our services are of international standard without the international price tag. The administration and charging system minimises concerns and facilitates your efficient and cost effective treatment, with positive benefits and outcomes. Your treatment is easily combined with a superb holiday in Vietnam, bringing its own special benefits not just to your physical health, but your sense of profound well-being – an extremely important factor for your full recovery. Our integrated health care treats the whole person, and nowhere takes care of your complete wellness better than FV Hospital.